The niche of an organism is the functional role that it plays within an ecosystem. The niche (better refined as the ‘ecological niche’) is determined by the abiotic factors, which comprise of living features such as animals, plants and fungi, and biotic factors. Biotic factors are the non-living, environmental features such as sunlight and water availability and weather, as well as resources such as food and other nutrients. The niche of an organism within an ecosystem depends on how the organism responds and reacts to the distribution and abundance of these factors, and in turn how it alters the factors. For example, when resources are abundant, a population grows, although by growing, the population provides more resources for predators. It can be advantageous for an organism to occupy a very specific niche, as this way they will encounter less interspecific competition; such organisms are called niche specialists. However, specialist species that occupy a very narrow or highly specialized niche encounter problems when there is a sudden decline or change in biotic or abiotic factors; if the organism is unable to adapt to the change, it becomes highly vulnerable to population decrease or extinction. For this reason, many species have evolved with the ability to thrive under a range of different environmental conditions, making use of a variety of resources; these are called niche generalists. It should be noted that the distinction between specialists and generalist species occurs on a continuum; some specialists are highly specialized, while others occupy a slightly broader niche and some generalists are more specialized than others. In the relative absence of ecological disturbance, specialist species are often able to thrive, which drives divergent evolution, and speciation. The full range of abiotic factors and environmental conditions that an organism can utilize and survive in is called its fundamental niche. However, there are restraints on populations, such as competition, predation and limits to resource availability; these restraints are called limiting factors. Limiting factors prevent populations from increasing indefinitely, restricting organisms to occupy their actual or realized niche. Giant panda bears (Ailuropoda melanoleuca) are niche specialists. They have a very limited diet, 99% of which consists of bamboo. They have evolved specially adapted thumbs, which allow them to grip the bamboo. Bamboo does not provide much nutrition, and so the pandas must spend most of their time eating, consuming around 70lbs of bamboo every day to support their large bodies. To conserve energy, pandas do not move very far, and so have a home range of around only 3 miles, near streams so that fresh drinking water is available, and where there are caves suitable for raising their young. Their highly specialized diet means that they do not usually encounter interspecific competition, and they live solitary lives so as to avoid intraspecific competition. Adults have no natural predators, so their populations are kept to suitable levels through their life cycles; in the wild they reproduce only once every two years, which means natural populations do not get too dense and intraspecific competition does not occur frequently. Because the niche of pandas is so specialized, they are exceptionally vulnerable to human impact and their populations have experienced dramatic declines. The biggest threat has been deforestation for farmland, mining and logging, which has destroyed most of their habitat. They are now restricted to the humid bamboo forests of a few mountains in South Western China where they prefer the cool temperatures at high altitudes of around 4,000 to 10,000 ft.
Coyotes (Canis latrans) are successful niche generalists. Originally native to deserts, these omnivorous opportunists are able to adapt to almost all habitats at many different successional stages, and altitudes up to around 9800 ft.
Their diets are highly varied, primarily consisting of rats, mice, ground squirrels and carrion, they also feed on snakes, birds, tortoises, fruit, nuts and grass; they eat almost anything they can find and they cause big problems to farmers by hunting sheep and domestic fowl. They can hunt by digging out prey, or ambushing and stalking, and can reach speeds of up to 40mph. They are also able to hunt solitarily, in pairs or in small packs. They are very tolerant of human activities and so have managed to integrate within urban areas, feeding from human waste. Because coyotes are able to adapt their niche quickly to changes in their environment, their populations are ever increasing, often to the detriment of other species, whose niche they exploit, causing competition. However, the removal of coyotes entirely from an ecosystem can be equally damaging; coyotes’ natural niche includes the predation of mesocarnivores such as foxes and raccoons, which eat songbirds and duck eggs. In the absence of coyotes, numbers of these birds decline rapidly. The island of New Zealand is a geographically isolated landmass off the southeast coast of Australia. Because of the great distance between New Zealand and any other large landmass, the only organisms that were able to colonize the land were those which were able to fly or float across the sea. Because migration on to the island was so difficult, the island community completely lacked mammals, except for three species of bat and mammals that were able to swim, such as seals and sea lions. In the absence of mammals, the native animals filled ecological niches of predation, scavenging and grazing, which are filled by mammals in most other ecosystems. This resulted in a diverse set of morphologically distinct birds, insects and reptiles, which are like no others seen on Earth. For example, the South Island takahē (Porphyrio hochstetteri) and the Kakapo Parrot (Strigops habroptilus) evolved to assume the role of grazers such as sheep, feeding on grass, shoots and leaves. The Giant Moa (Dinornis robustus and Dinornis novaezelandiae), although now extinct, were large birds, growing up to around 12ft tall and over 500lb in weight. These birds fed on twigs, leaves and other various plant parts, assuming the niche that in other parts of the world is filled by deer and other ungulate browsing herbivores. The Kiwi, a nocturnal bird of the genus Apteryx, assumes the niche that small mammals such as mice and moles usually fill, feeding on seeds, fruit, invertebrates and grubs. The only predators on the island were flying birds, so in the absence of land-based predators, and as a result of their terrestrial niche roles, many of New Zealand’s birds evolved to become flightless; even the bats spend most of their time on the ground. When humans first arrived on the islands around 700 years ago, they brought with them rats and dogs, and later, Europeans brought stoats, pigs, dogs, cats, sheep, cattle, deer and many other animals. This has been devastating to the native wildlife; they are either outcompeted by other organisms that are adapted to fill particular niches or they are directly predated on because they lack protection against land-based predators. The case of New Zealand’s birds is not entirely an anomaly. Islands that have been isolated for a long time often develop their own unique flora and fauna which have evolved to fill niches in the absence of other organisms. For example, the lemurs of Madagascar evolved diverse adaptions to fill many niches not usually filled by primates, due to Madagascar’s varied terrains and habitats and a lack of other types of mammal. Another famous example of niche adaption is Darwin’s finches on the Galapagos Islands. These birds evolved different beak shapes and body sizes on each island, according to the types of food that was available. 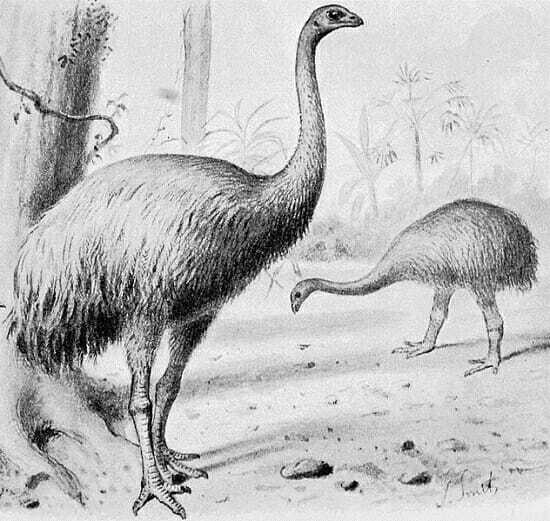 The image above shows a Giant Moa of New Zealand evolved to fill a niche that is usually filled by browsing herbivores such as deer. Competition – An interaction within or between species, where either organisms or populations are competing for the same resource. Realized Niche – The actual amount of resources or environmental conditions that an organism is able to utilize within an ecosystem. Fundamental Niche – The total range of environmental conditions that is suitable in order for an organism to exist, in the absence of limiting factors. Limiting Factors – Factors such as food, access to mates or climate, which prevent organisms from fulfilling their fundamental niche. 1. What is the niche of an organism? A. The habitat that it lives in. B. The full range of conditions that is available for an organism to use. C. The full range of interactions it has with an environment’s abiotic and biotic factors and the effect that the organism’s presence has on other organisms and the environment. D. The conditions that limit the growth of the organism’s population. C is correct. The niche of an organism depends on how it responds and reacts to abiotic and biotic factors within an environment, and the effect that it has in turn on those factors. C is correct. Specialist species usually benefit from reduced interspecific competition; however, because their niche is reliant on a certain resource or habitat, they are usually very vulnerable to change in this factor. 3. What can the successful adaption of different niche roles by organisms result in? A is correct. When organisms adopt a new niche role successfully, this can result in speciation and can increase biodiversity. This is especially true for niche specialists.